Or so it seems on its face, being a novel about unapologetic socialists throwing socialist parties, writing socialist stories, advocating the global advancement of socialism, and doing all such things that befit a practicing socialist. In reality, though, Jewish author Chaim Potok was far more intent on analyzing the correlations between one’s politics and one’s religion than he was with promoting any political or theological philosophy in particular; and yet still he managed to fill his book with Jewish traditions, texts, and tenets that I’m not remotely familiar with as a Christian, being less than optimally observant of Christianity’s own recommended traditions concerning regular church attendance and Bible reading. It would appear that I was penetrating uncharted territory, a somewhat non-religious individual looking into a novel that was decidedly religious in subject matter. As it turned out, Davita’s Harp is actually an exhortation for readers to consider what makes a person truly “religious”, beckoning them to juxtapose faith with fellowship, belief with acts, and to thoughtfully contemplate the reasons why people gravitate towards or fall away from any god. Ilana Davita Chandal is the offspring of two seemingly dichotomous heritages circumstantially united by a common loathing of landlords, fascists, and capitalist exploiters of the proletariat. Her mother Channah is a non-believing Jew, her father Michael a “non-believing Christian”, which doesn’t that make much sense, but together they form a secular couple of raving Communist Party members raising their only daughter in and around Manhattan. If the book has any distracting flaw, it’d be that the dialogue sometimes borders on clichés: the parents habitually talk like villains plucked from a less than subtle Ayn Rand novel, and the speech of Ilana’s devoutly Christian Aunt Sarah is also excessively flowered with references to “Almighty God or to the Heavenly Father or Merciful God or Most Loving God or to our Savior Jesus Christ or Jesus Christ or Lord” or verily all other derivatives, though these touches may very implausibly be intentional devices by the author to emphasize the narrator’s imperfect memory. Whatever the case, Ilana is steeped in politics from the age of six, breathlessly following the Spanish Civil War in articles her father writes for a left-wing paper and rarely hesitating at school to voice her resentment of the Fascists Hitler and Franco in Europe. Unlike the vast body of WWII-period fiction, Davita’s Harp offers a unique perspective on this era by depicting the adversities of Jews who were safely withdrawn from Nazi Germany’s conquests but passed every day knowing that friends or relatives were threatened in more savage parts of the world. 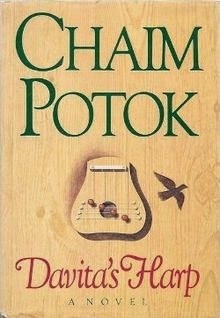 Here it is not the action of war but the reaction to it that propels Potok’s story, which largely eschews the trappings of clear framework, direction, and closure in favor of portraying realistic characters who are gradually shaped by seemingly disconnected scenes and international conflicts. Potok’s narrative structure and authorial voice are also distinctive in his method of showing images rather than telling them, feeding readers often fragmented and confusing glimpses of conversations neither fully understood nor fully conveyed by the young girl witnessing them. The 1st-person presentation is deeply internalized and reflective of the protagonist’s naiveté, ever focused on external signs and usually incapable of discerning the underlying implications suggested by words or, conversely, by silence. These implications are left for the reader to interpret on his own, just as are the many symbols woven prominently throughout the novel, from the obvious door harp of the title that Ilana imagines as sheltering two birds, one from her storytelling Uncle Jakob Daw and one from the devastating massacre of Guernica, to the picture overhanging her bed of three stallions galloping across a red-sand beach. Ilana, and Potok by extension, never plainly explains what significance these things pose to herself other than to affirm that they are significant, perhaps as a reminder of those she has lost, perhaps as spiritual props for her skeptic’s mind. Even secular leftists, with their false faith in human government’s power to cure poverty and other human ailments, occasionally look up to a higher being when dealing with personal anguish. Ilana eventually comes to join her aunt in prayer because she longs for love and company. “There was a comfort in the kneeling and a sense of my exhausted self yielding to the embrace of a presence I could not understand but felt all about me as I did the wind and the sea.” In the same manner she begins to visit synagogue and participate in traditional Jewish ceremonies, not so much out of reverence for God as out of a desire for brotherhood with her neighbors, a cause espoused by her own mother, who airily postulates that “it’s important to be with people”. She attracts a lot of ire within the synagogue for joining the men in reciting a prayer of mourning called Kabbish, though again she does so not because she believes the prayer’s words but because she believes she owes such an honor to the one who passed. As Ilana is drawn to religion by personal friendships and emotional thirsts, so too we gradually learn that her mother had been repelled from religion by equally powerful personal grievances. In many cases, the novel quietly asserts, the affinity or revulsion that people bears towards any faith or religious community is not inspired by its actual teachings but by single events which profoundly affect their ability to rationalize their belief or disbelief. Potok stated that he wrote Davita’s story as “a confrontation between two fundamentalisms… the secular fundamentalism represented by Marxism, Stalinism, and communism, and the religious fundamentalism of the extreme right in [his] own tradition”, and while the book certainly discusses that to some degree, it’s also a challenging examination of how personal experience affects one’s beliefs and how those beliefs are or aren’t always mirrored in one’s deeds. Much like the characteristically ambiguous and depressing animal parables that Uncle Jakob imparts to Ilana, Davita’s Harp seems to wind down rather abruptly, whisking through three years in the last hundred pages where the first 250 pages covered only one, and it ultimately ends without an ending, but by then the author has already provided us a wealth of ideas to mull over, not just about his characters but also about ourselves and the relationships we share with God.